Brendon Bevan is chief wildlife warrior and a passionate conservationist. He is the South Australian public officer for Wildlife Tourism Australia and has been actively engaged with South Australian National Parks’ ‘Bounceback’ program, a landscape scale conservation program. Experiential luxury safari lodge and overland walking safari. Luxury Lodges of Australia. Arkaba is a beautiful outback property that has been transformed from a sheep station to a private wildlife conservancy. Located in one of Australia’s most ecologically significant landscapes, South Australia’s Flinders Ranges, Arkaba is a blend of conservation and tourism. The Arkaba homestead dates back to the 1850s and it played host to a number of early explorers, including John McDouall Stuart and has been restored with the integrity of the original structure. An ancient landscape moulded by millions of years of geological activity, the Flinders Ranges offers some of Australia’s most spectacular outback scenery. Arkaba’s 60,000 acre private conservancy is home to a wondrous variety of bird and wildlife and a remarkable conservation story. 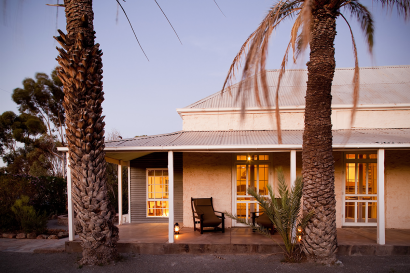 Guests enjoy the five bedroom 1850’s homestead and expert guiding while a few of Wild Bush Luxury touches ensure comfort, style and a truly memorable outback experience. For the more adventurous, the Arkaba Walk offres the chance to camp out under the stars while exploring the country on foot. Arkaba’s true luxury comes in the fact that its 60,000 acres are shared by just 10 guests, taking the definition of exclusivity to a new level in Australia. 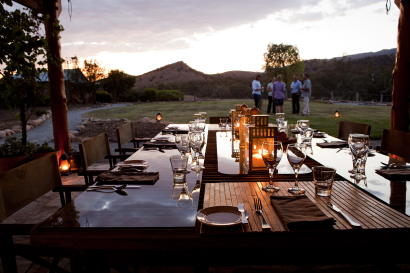 Hosted dinners and sharing stories with field guides and fellow guests provide an atmosphere more akin to staying with friends in the country, or a private safari lodge than a typical luxury hotel. 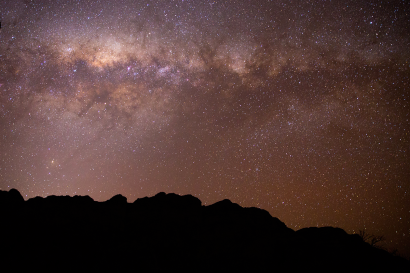 Stretching north from Port Augusta into the sun-seared wilderness of South Australia’s deserts, the Flinders Ranges is one of Australia’s most impressive outback locations. The Flinders Ranges offer one of the most accessible outback destinations in Australia – just 5 hours’ drive or one hour flight from Adelaide or Kangaroo Island, four hours’ drive from the wine country of the Barossa Valley, three hour’s from the Clare Valley wine region and little over an hour from Port Augusta. Arkaba is situated on the southern edge of Wilpena Pound and the Flinders Ranges National Park. The Flinders Ranges are one of Australia’s most ancient landscapes with Arkaba having an Aboriginal history going back thousands of years and a geological history dating hundreds of millions of years. 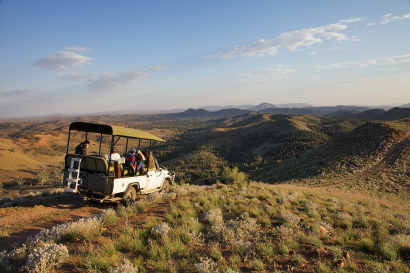 Expert field guides live and breathe the bush and through a mix of walks, open top safari drives and sheer passion, they will open up the secrets of Arkaba, the Flinders Ranges and its prolific wildlife. 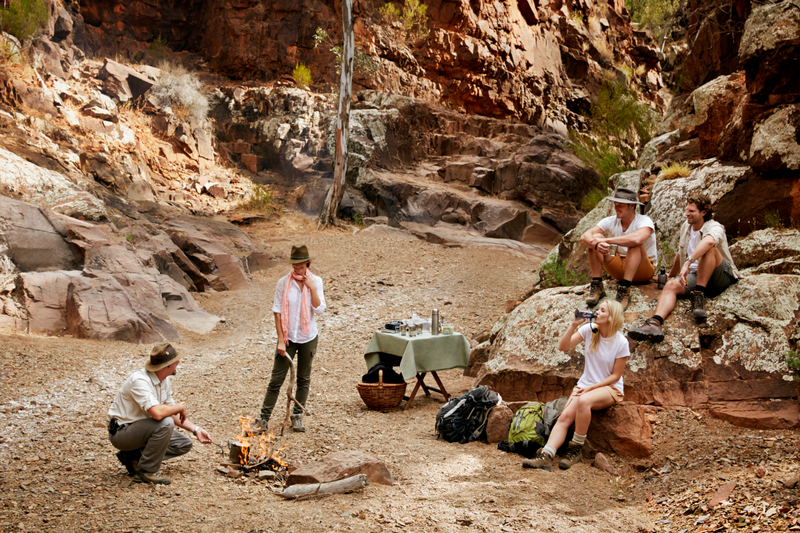 For the more active, Arkaba offers some of the best bushwalking in the country; for the soft adventurers, an open top safari drive reveals the vistas and secrets of the property in a different way, usually capped off with a sundowner drink on top of the ranges with the scale and grandeur of outback Australia laid out for miles around. Results of conservation efforts have confirmed the reestablishment of two colonies of Yellow-footed Rock Wallabies and 10 new bird sightings including the Stubble Quail and Spotted Nightjars! Wildlife artist Rosie Woodford-Ganf has lovingly crafted bedheads fashioned from recycled fence posts and fleeces, Gumnut tassle curtain ties and floor lamps made from early explorer’s tripod theodolites. A wonderful selection of her wildlife paintings and prints take pride of place on the walls throughout the homestead. Arkaba has a guest to land acreage ratio of 1 : 6,000. We believe that connecting children to the bush is fundamental to their education. Minimum age is 8 years and field guides will immerse children with stories from the bush. 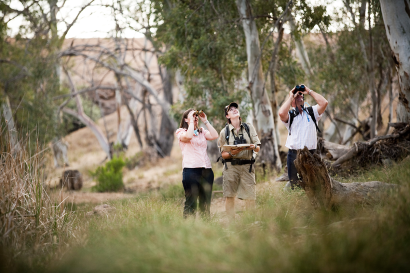 Activities may include orienteering using a map and compass, gathering native herbs to make traditional damper bread, species identification and they’ll learn how to track wildlife using their habits and behaviours. Setting camera traps or radio tracking feral species, or maybe even making their own sundial. With only five rooms, the best way to experience Arkaba as a family is with an exclusive use stay, either with another family or on your own. Learn the conservation story behind this sheep station turned private wildlife conservancy from chief wildlife warrior and property manager, Brendon Bevan. With just five rooms the homestead is an oasis of comfort and style amidst a harsh and rugged landscape, where guests enjoy a taste of classic Australian country hospitality. Each bedroom has an ensuite bathroom and opens out onto a shaded verandah with individual views of the surrounding ranges. 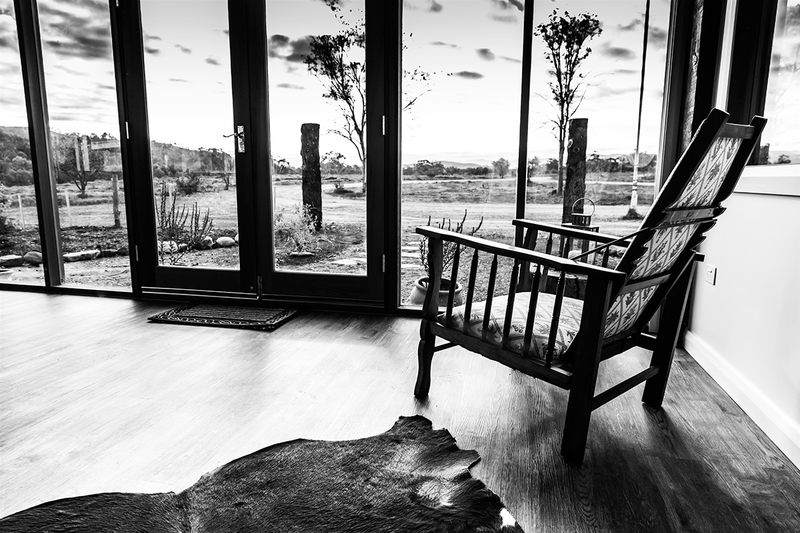 With decor by wildlife artist, Rosie Woodford-Ganf – think bedheads fashioned from recycled fence posts and fleeces, curtains tied back by gumnut tassles, lights perched on explorers’ tripod theodolites – the guestrooms retain a sense of history and place. As the layout of the original homestead has been retained, each room has a character of its own and has been named after early settlers, explorers or property owners. 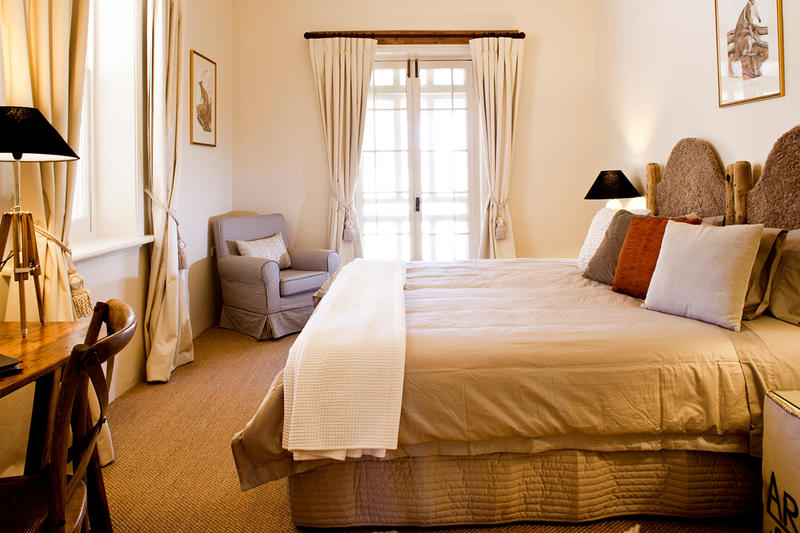 Four bedrooms are located in the homestead, while the Coachman’s Cottage in the corner of the garden provides a fifth guestroom. The rooms are air conditioned and have been designed with the homestead’s heritage in mind, a mix of king and twin beds have premium mattresses, organic cotton sheets and a choice of pillows to ensure a great night’s sleep. With no telephones, televisions, minibars or the typical features of a hotel room to distract, the focus is on the experience and one of the most beautiful properties in Australia. Arkaba has adopted a ‘buy local’ principle and the head chef uses the very best of South Australia’s produce to craft the food program with a few native elements to add a unique intrigue and interest. A stay at Arkaba is all inclusive of chef-prepared meals and beverages from an open bar. 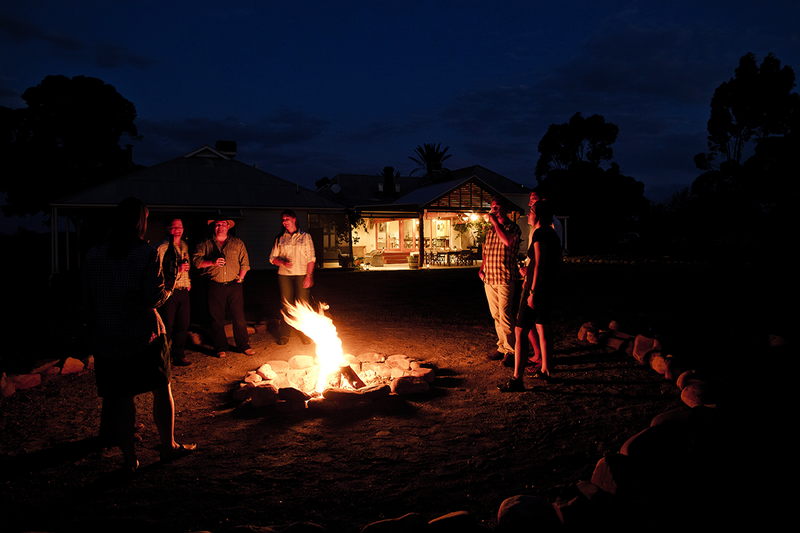 Hosted dinners and sharing stories with field guides and fellow guests provide an atmosphere more akin to staying with friends in the country, or a private safari lodge. 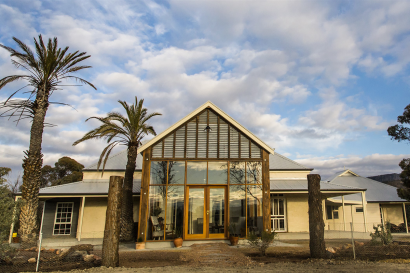 A purely South Australian wine cellar has been selected to showcase a cross-section of wine growing regions with the grape varieties for which they are best known. The bar is completely open and the chef will adapt very specifically to guest tastes and needs. Evening drinks are often enjoyed on top of the ranges with the scale and space of the outback stretching for miles around. Dining around an old wool classing table on the outdoor terrace with the ever-changing light and sounds of the bush all around is a special and uniquely Australian experience. It is not only landscape rehabilitation, biodiversity conservation and thriving wilderness at Arkaba. So much self-presevation, restoration and renewal happens when we tune into nature and deepen the connection with the land, with ourselves and the person by our side. There’s something about being in true wilderness that has a way of getting into your heart. Let the morning sound of galahs from the Arkaba Creek transport guests even further away from their regular city soundscape. The swimming pool overlooking the Arkaba Creek is a welcome retreat after a morning or day spent exploring the bush.And at night a fire pit in the corner of the garden provides the perfect setting to watch the stars appear over this ancient landscape. Arkaba is all about reconnecting with the environment that sustains us. With only five rooms, the best way to experience Arkaba is with an exclusive use stay. 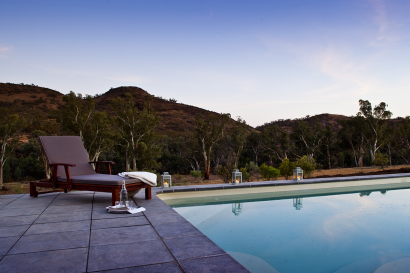 To book the entire homestead the cost is equivalent to paying for nine out of ten adults, so one guest will stay and enjoy the complete Wild Bush Luxury experience – accommodation, meals, drinks and around seven hours of guided safaris each day free of charge. Back in the blade shearing days, the historic Arkaba Woolshed (4km from the Arkaba Homestead on property) was a 40 stand shed but now, with electric wide combs, it is a five stand shed. Still to this day you will find names etched on the stone wall of shearers gone, dating from today right back to the late 1800s. National Geographic World Legacy Awards 2016 – Finalist of 3 worldwide in ‘Conserving the Natural World’. 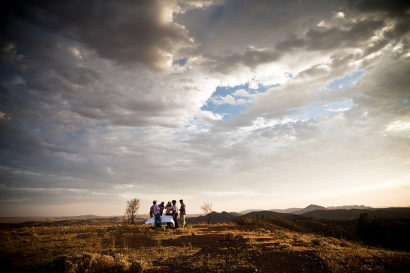 Australian Gourmet Traveller 2012 – Best Outback Experience (Expert Panel Award). 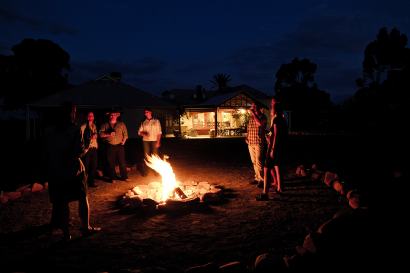 South Australian Tourism Industry Council (SATIC) Awards 2012 – Silver Award in the Eco Tourism category. Australian Gourmet Traveller 2010 – Top 100 Greatest Australian Gourmet Experiences.